After my last minute decision to catch KISS live at Maple Leafs Gardens in Toronto [Ontario, Canada] in 1992 and with my network of heavy metal music lovers only a very small fraction of what it was, I pretty much stopped following the heavy metal scene for a few years aside from a few bands such as Helloween. Given that I was buying tennis and hockey magazines rather than music ones, there was no internet yet and with music changing for the worse with grunge starting to dominate the music scene, I retreated to listening to all of the albums that I had acquired in the last decade while taking a little break from following the hard rock and heavy metal scene. I was quite shocked one day to see at my local record store that KISS had a new album out called Carnival Of Souls: The Final Sessions. It was odd to me since I had seen the reunited original line-up of KISS in make up for the first time live in 1996 so I wasn’t expecting a new studio album from the group without make-up, Ace Frehley or Peter Criss. Being a massive KISS fan, I bought Carnival Of Souls with no questions asked or any inkling what the musical direction might be on the album. I figured that KISS had likely recorded another studio album after Revenge and decided oddly enough to release it after starting their very successful reunion tour. Given that KISS‘ last studio album was the very good Revenge, I figured that even if there was a drop in quality on the latest studio album, it wouldn’t be that much of a drop. After all, KISS had delivered some terrible albums in the past (Music From The Elder comes to mind immediately) but had never followed up a terrific album with a complete dud… until now. I still remember my initial thought after listening to Carnival Of Souls for the first time — “Man, there wasn’t one good song on that album.” At the time, I had not put two and two together and figured out that the mighty KISS — the band that at one point was arguably the hottest band in the land — had made an ill advised attempt to join the grunge genre. Eventually, it became obvious that this was exactly what KISS had tried to do but failed miserably in the process. KISS — or more specifically Gene Simmons and Paul Stanley — have always craved success and more accolades no matter how many they have gotten in the past. Starting in 1979, KISS had also proven to be followers rather than trendsetters. The first “follow the leader” move for KISS was with Dynasty and KISS‘ disco hit “I Was Made For Loving You.” Quite clearly, the group decided that getting a disco type hit and following the trends was the right thing to do rather than play actual rock n’ roll. Don’t get me wrong. I like Dynasty include the band’s disco hit but it was clearly a jump on the bandwagon type album. 1981’s Music From The Elder wasn’t so much a “follow the leader” album as a terrible faux pas into thinking that KISS would achieve success by making some sort of concept album based on some sci-fi story conjured in Simmons‘ brain. 1984’s Animalize saw KISS hire guitar shredder Mark St. John with his faster than lightning shredding. Another “follow the leader move” from KISS although it was certainly a good album. 1986’s Asylum saw KISS go glam with their costumes following the trend of seemingly all hard rock and heavy metal groups softening their look and music (including Judas Priest and Iron Maiden) and going glam. It was no surprise to see KISS adopt keyboards and/or synthesizers in a big way on 1988’s Crazy Nights because once again, the band was following the trends (albeit kind of late when you think Priest‘s Turbo and Maiden‘s Somewhere In Time came out in 1986). After Crazy Nights, it seemed that KISS were going in the right direction and not necessarily following the trends with the solid Hot In The Shade and Revenge. Even though Revenge was a return to form including in terms of album sales, Stanley and Simmons couldn’t resist jumping on the bandwagon one more time. This would this time end with them falling flat on their face with what can only be described as a terrible album. Luckily for Stanley and Simmons, their reunion tour with Peter Criss and Ace Frehley was still going strong so it seems that they were forgiven for the lacklustre Carnival Of Souls. The beginning of that album is a warning of things to come. Weird distorted sounds can be heard before a dark guitar riff starts Simmons‘ track “Hate.” Eric Singer‘s drumming sounds great on “Hate” but sounds like a different style of drumming than what should be heard on a glam metal band’s album. From there, it’s mostly downhill with KISS‘ songs — including the ones from the usually upbeat Stanley — sounding dark, gloomy and depressing like most of the grunge era albums at that time. Stanley and Simmons were obviously very serious about scoring that big grunge album hit as even the song titles are kept very short (for example, “Hate,” “Rain” and “Jungle”) similar to what could be found on an Alice In Chains record. There are a couple of tracks that could have been found on other KISS albums like the Simmons track “Childhood’s End” (which sees the bassist singing with some nice melodies) and the Stanley ballad “I Will Be There.” Aside from those two songs, it’s one song after another trying to capture the next grunge hit with distorted guitar sounds, very few decent melodies and dark sinister feelings. Of note, Carnival Of Souls sees the debut of guitarist Bruce Kulick handling the lead vocals on the album closer “I Walk Alone.” It’s a weak track that really does nothing to cement Kulick as a possible alternative as a singer for the band. So who do you blame for this catastrophic album? Simmons and Stanley of course have to take most of the heat for following the leader once again in their quest for their next big hit. Kulick also is likely to blame given that the guitarist has co-writing credits on nine of the twelve songs on the record. Having Alice In Chains producer Toby Wright co-produce Carnival Of Souls certainly played a huge role in the first and only grunge sounding KISS record but Wright‘s hiring likely falls squarely on the shoulders of Simmons and Stanley. 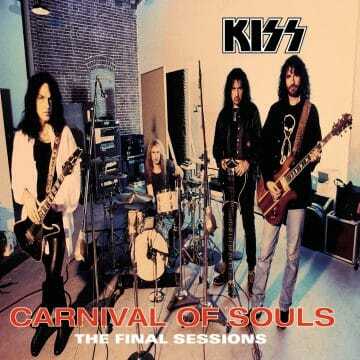 Overall, Carnival Of Souls is one of KISS‘ weakest albums and the last real “follow the leader” / “follow the latest trends” album from the group. Then again, KISS have only released three studio albums in the last 20 years after Carnival Of Souls so they may well have one more “follow the latest trends” album in them. Hopefully not but you never know when Simmons and Stanley will succumb one again to the allure of potential album sales.